Yahoo! Finally got internet connection at my mom’s place….that means you can see regular blog updates from now onwards….Yesterday my friend called me to ask….what she can suggest to her 6 year old daughter to prepare at her school event, where the theme is to prepare a recipe without using electricity, gas and fire. No electricity means no blender, microwave, etc…without gas means no cook….without fire means no other source of cooking….Though the restriction sound simple….the number of recipes are also few….Keeping the age of the girl in mind, the first thing which came to my mind was Lassi…..as it is no fuss and no mess recipe….But lassi sounded simple to me….then I thought of simple chat with puffed rice…. made with sliced tomatoes, onions, chat masala, lemon juice, salt and coriander leaves….then dropped the plan thinking the puffed rice may turn soggy if the event last long…. 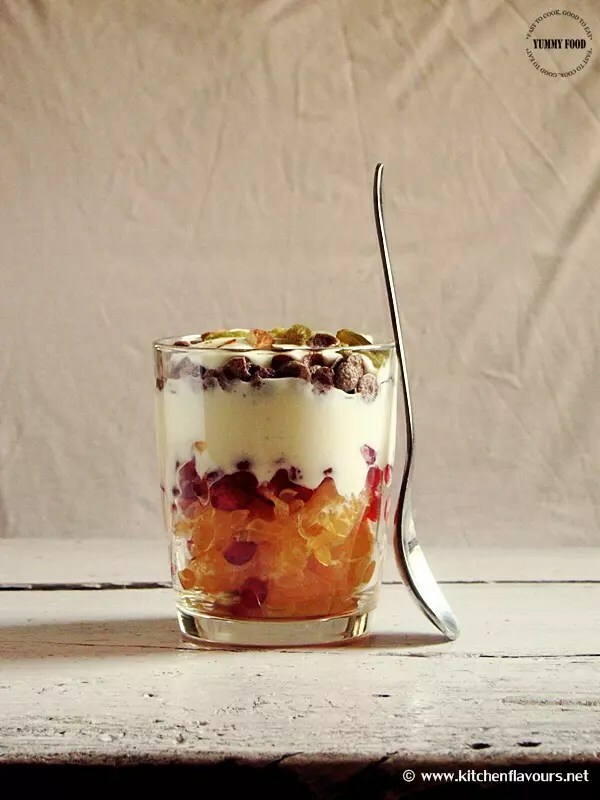 ‘Parfait’ is one of the simple recipe which I love eating most of the evenings to satisfy that untime hunger….and sometimes in the morning as breakfast…when I want to settle down with something simple….. The recipe which I make mostly at home calls for simple fruits, dry fruits and yogurt mixed with vanilla essence and honey. Scroll down to check the recipe in detail….. Whip yogurt with honey and vanilla essence. Stat to layer by adding sliced oranges, pomegranate seeds, above made yogurt, ragi cereals, almonds and raisins. Repeat the layers if necessary. Add love to make this recipe more ‘Yummy’. As I had oranges and pomegranates at home…I used those in making. Choices on fruits and nuts are endless so play around. You can even use flavoured yogurt’s which are easily available in market these days in making this. You can even substitute ragi cereals with corn flakes or oats or muesli. Add love to make this Mixed Fruit and Yogurt Parfait taste ‘Yummy’. Excellent and gorgeous parfait, love the way you have presented that too with ragi cereals.. This looks so delicious Lubna! I don't mind being a 6-year old again if this is a cooking project at school! Super tasty and appetizing one !! thats a deadly mix.when, beauty and health intermingles. perfect, dear. great parfait ! wonderful clicks !